Tina LaValley cannot believe what she sees in the news - that her son, Randall Lints, allegedly beat, burned and starved her grandson, 7-year-old Jack Loiselle. "He's not a monster like they're saying he is. He's not a monster," said LaValley, sitting in her western Massachusetts home. Loiselle was rushed to the hospital in a coma on July 14 after Lints called 911 saying he found his son unresponsive in their home in Hardwick. "There's no way," she said through tears. "There's no way he could of done something like that." Lints allegedly told police Loiselle had fallen out of bed a few days earlier, but according to court documents, doctors found extensive older bruising across his body and blistering burns on the soles of his feet. They also say the second grader was dehydrated and weighed just 38 pounds, having lost about a third of his body weight over two months. "He goes, 'Mom, I didn't do it. so don't worry about it,'" said LaValley. "I said, 'If you didn't do it, then what happened?' He goes, 'I didn't do it.' I went, 'OK.'" Court documents paint Lints as a strict disciplinarian. 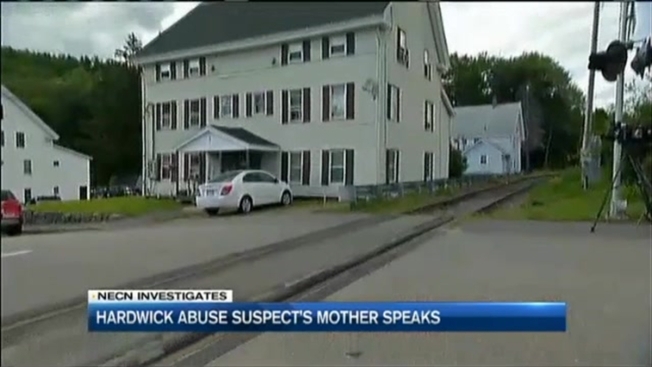 According to affidavits from social service workers involved with the family, Lints made Loiselle scrub the floors with bleach after he wet his pants and kept him in his room with an alarmed door and security camera - away from his stepbrothers and sister playing in another room. But LaValley says the camera and alarm were a necessary evil - that Jack had hurt the family cat so badly it had to be euthanized, that he had choked one of the toddlers, punched another, and would sometimes hurt himself. Lints, she says, watched him like a hawk. "It hurt him, because he couldn't help him. Sometimes he didn't know if he was doing the right thing or not by keeping him," she said. "He goes, 'Mama, I've gone everywhere to get help, and nobody's helping.'" According to the state, Lints voluntarily sought services from the Department of Children and Families less than a year after gaining custody last June. They both received therapy and support from state-contracted social service organizations and a DCF social worker had seen them three times in the month before Jack was found starved and unconscious. "They failed both of them," said LaValley. "The state should have seen - listened to what my son was saying about the issues that they saw with Jack." The issues - as she calls them - seem all too familiar to LaValley. She says when Lints was Loiselle's age, he was happy, but hyper. She says that hyperactivity took a darker turn and he would have angry, violent outbursts. She said once, in a fit of anger, Lints grabbed his older brother from behind and held a knife to his throat. He was 10 years old at the time. "He was finally diagnosed with bipolar - borderline schizophrenic," she said. Though the state will not confirm it, LaValley says Lints was placed in DCF care and bounced in and out of foster homes and residential facilities until he aged out of the system. It would be another six years before he would learn for sure that he was Loiselle's father. LaValley says she warned Lints about fighting for custody. "'You already have two kids. You don't know how Jack is,' I says. 'You don't want to put yourself in that situation,'" said LaValley. "[He said], 'I don't want nobody calling me a deadbeat dad. I'm not going to be a deadbeat dad. That is my son. I'm gonna raise my son.'" LaValley says Lints repeatedly asked DCF for help, but was reassured by his social worker that he was on the right track. "A great advocate for the kids," LaValley said the social worker said of Lints. "When somebody tells you something like that, you think you're doing the right thing. You're not going to think you're doing the wrong thing." Necn asked LaValley if she thought, given his own troubled and violent history, the state should have given Lints custody of Loiselle in the first place. "I'm not saying he's innocent, I'm not saying he's guilty. I'm not sayin' nothing. I'm just going to wait," she said. "The truth will come out." The state now has custody of Loiselle. A DCF spokesperson has just updated his condition. "We remain deeply concerned about the well-being of the child who is medically stable but unresponsive. He is being prepared for transfer to a facility that specializes in long-term rehabilitative care. We are grateful to his team of clinicians for the quality care they have provided," wrote Andrea Grossman in a statement. "The complex and distressing circumstances surrounding what happened to this child warrants no less than a full, comprehensive review. The findings and recommendations of this review will be completed and made public on or about September 24." Lints is being held without bail. He is due back in court Aug. 19 for a dangerousness hearing.